All players, whether they realize it or not, have a process as to how they approach a new codex, change in rules, or entry into a new game. Competitive list building is a different process then some of you may be used to. The goal of this article is to explain the how and why of my approach to it, with some caveats along the way. 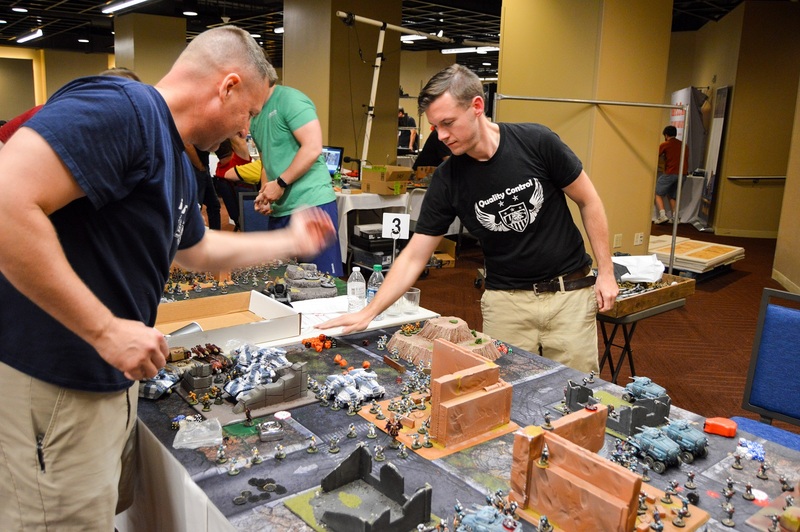 The first caveat: I’m primarily a competitive/tournament player, and what follows is more how I naturally approach building a list or dissecting a new book – this isn’t necessarily exactly what I’ll play at a fun Friday night game at the local game store. It’s important to adapt to your environment and not make the experience miserable for you or your opponent, but that being said – if you’re at a tournament, most would agree it’s socially acceptable to play a well-tuned list – so don’t feel bad about doing so or let it unduly influence the decisions you make. Andrew playing at The NOVA Open 2017! Basic grasp of dice probability, math, and the ability to be honest with yourself and apply it whether you like the answer or whether it “feels wrong” or not. A grasp of the current metagame – you need to have been playing or at least observing enough tournament games – preferably at the GT level. Believe it or not, looking at just what won is generally the least important part. Knowledge of your own playstyle. 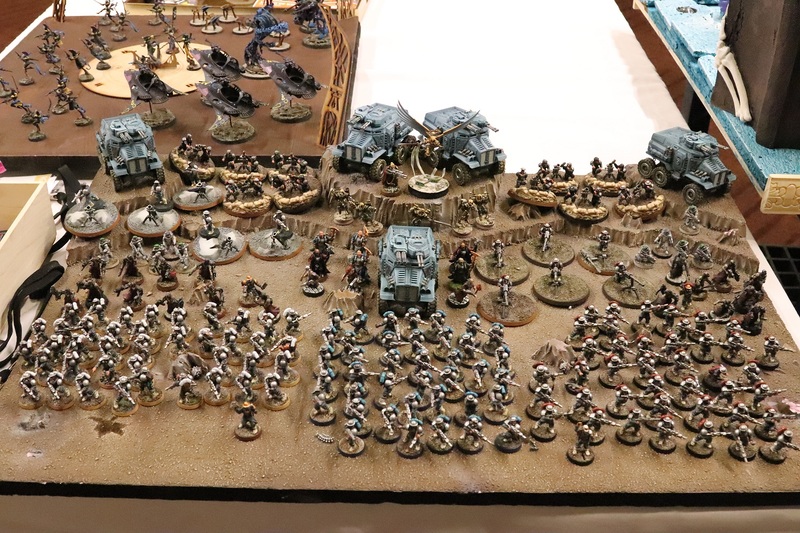 Personally, I know I play better/favor shooting based armies, with at least a decently high model count and lots of units. That isn’t always the best list, remember the days of centstar, thunderstar, screamerstar? That definitely hurt me during this time period, and I knew I was doing it. I also knew no matter how much I tried, I would never be as good of a star player as I would an anything-else-player. Now that all of that is out of the way, onto the actual meat – you’ve got a new codex in hand you’re looking to play, but it’s a hundred pages of datasheets, separate points cost tables, a bunch of stratagems, warlord traits and special rules and, oh god I thought this was a simpler edition! First off, you can generally assume no matter how great the book, about 85% of it is “trash” (not optimal) to a competitive list, and you’re going to quickly move past it. This even includes Astra Militarum. Bearing that in mind, I begin at the end and review the unit sizes and points cost per model. Units that seem to run overly cheap (because a wound is a wound) I hone in on – any time you’ve got a model, you’ve taken up board space, and there’s some value in that at a fundamental level. This can be a bit harder this edition, as you can tell at times they balanced the points of more elite units by making the model cheaper, but the wargear it’s going to come with – generally a piece that only it or a very limited set of models can take – very expensive. The perfect example of this are Dark Reapers – the model is sub 10 points, but the gun it has to take brings that to about 30. So don’t get too excited, especially when it concerns the more elite models that you know are going to come with fancy ranged or close combat weapons. You can follow the same process for the weapons list to an extent as well. Now that you’ve got your mental short list, it’s time to go review the datasheets and see what they actually *do*. Being cheap isn’t very useful if they’re terrible. At this point, I’ll usually give the rest of the sheets a cursory skim to look for anything out of the ordinary. I place higher value on things with weird deployment rules (scout, infiltrate, deepstrike), higher movement values, neat abilities or auras, and weapons – especially since we’re in a new edition – that seem to do more than I’d expect. Second Caveat: I stay away from units that are using what I think are BS/loophole rules. This is for a couple reasons. I expect 1) people will be really irritated and I like enjoying my games, and 2) they’re likely going to get fixed and I don’t like wasting my time/effort/money. An easy litmus test for this: if you have to explain to someone how it works with the phrase “okay so technically…” you’re probably in a dark, dark place that you should leave immediately. The above is probably a 20-30 minutes process if I’m sitting around with a PDF or book and few distractions, and now I’m ready to write my first list. Based on the units I felt were the standouts – primarily focusing on the most efficient ones – I start writing stress-test lists. Basically, I spam the heck out of those things and see the most I can squeeze from the detachments and the most efficient configurations of slots with the least amount of tax – generally in the form of mandatory HQ or Troops. An important note here – a lot of tournament lists seem to stop at this step. To be clear, I don’t recommend actually running this kind of a list. The point of this step is just to figure out what is possible, and what you might run up against at a GT if someone does stop here and creates an imbalanced army. Next, I tone the lists down to what I feel I actually need to accomplish the goal I’m going for. If the goal for my first unit of choice (conscripts) was to present more bodies then a reasonable person could kill and to screen my more important units, I don’t need the possible ~400-500. 100 to 200 will accomplish the same goal in 95%+ of matches, and won’t make you quit 40k out of misery and back pain. The weight of a thousand suns. . . I walk through my lists like that until I narrow it down to something that looks halfway thought out. Many units will drop off along the way – in my early day one guard drafts I had a variety of tanks – I then decided Taurox Primes were the way to go and cut the rest. I began solving anti-tank with drop melta, drop plasma, smite, and long ranged sources (autocannons, lascannons, etc.). After some quick math it became clear smite and plasma were the obvious choices – so the rest got cut. Once I’ve messed around with this for an hour or so and went back to reread some rules and units, I’ll find myself at what I feel is the “best” list I can make at the moment. Frequently I’m just mulling over this in my head at work during the day idly, so it doesn’t actually require a lot of dedicated time as long as you can look at/remember the costs of things fairly easily. At this point, I’m ready to test my first draft and refine from there. As testing goes on I find most lists I make end up gaining more variety as far as units go. I figure out tools I wasn’t aware I needed or obvious and not so obvious counters to the strategy I was taking, and figure out how to problem solve the situations. If your lists become *more* spammy as you test, you’re probably missing the point of what went wrong for you in your games.